Founded in 1987 by visionary Jane Davenport Jansen, Quarryhill is one of the globally pre-eminent Asian botanical gardens, featuring one of the largest collections of documented, wild-collected Asian plants in the world. Just over 20 years old, Quarryhill is a mature, world-class garden with full-sized trees to 65 feet tall shading glades and copses of temperate Asian plants, including many rare and endangered species. Collection of seed before extinction occurs. Propagation of seed in our greenhouse for ultimate garden planting. Growing plants to provide seed for future reintroductions to native habitats. Annually, Executive Director Bill McNamara and other staff members join with plant hunters from other institutions such as Royal Botanic Gardens, Kew, University of British Columbia Botanical Garden, Howick Arboretum and Missouri Botanical Garden, to trek deep into the mountains of China, Japan, and other Asian regions, government permits in hand, and often accompanied by botanists from local institutions to harvest rare seed and herbarium specimens. Documented, wild-source plant materials – no hybrids, no crosses and no nursery plants – are what most researchers require for their projects, which include DNA analysis, molecular studies, phylogenic and distribution studies. Quarryhill provides such research plant materials to prestigious institutions including UC Berkeley, Morris Arboretum at the University of Pennsylvania, Arnold Arboretum at Harvard, Missouri Botanical Garden, University of British Columbia and US National Arboretum. Quarryhill conducts docent-led tours for adults, seminars, and half-day educational tours of the Asian woodland garden for 4th and 5th grade classes in Sonoma County. The elementary students wind through the garden in the manner of plant hunters in the wild, collecting seed, leaves, fruits and flowers for examination. In the process, various elements of the California state science curriculum are taught, and topics unique to Quarryhill are illustrated. In addition to formal programs, a primary goal is to inform the public about critical conservation issues by providing a place of beauty and reflection in order to make connections between people, plants, and the environment, and inspire closer stewardship of that environment. The garden welcomes visitors, and is open for both self-guided and docent-led tours year-round, seven days a week, as well as group and organization tours and events. To learn more, visit Quarryhill Botanical Garden. 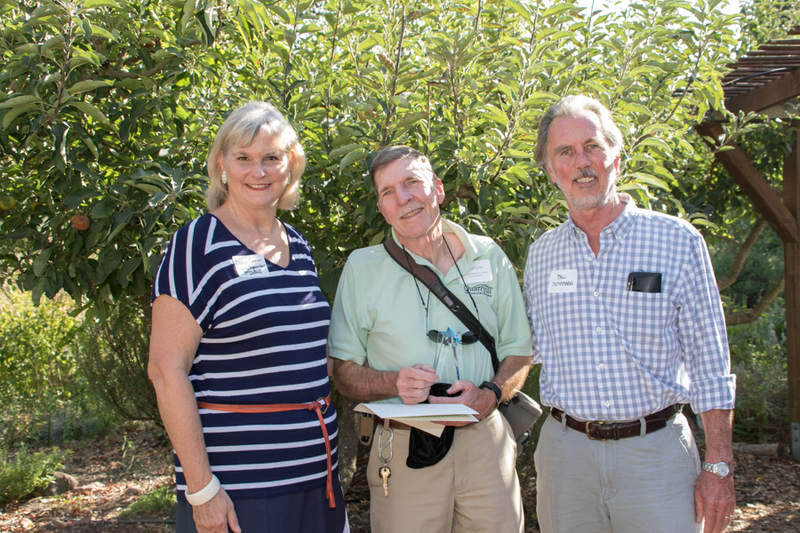 Bill McNamara (right) and Supervisor Susan Gorin present the Quarryhill Botanical Center's Star Award to Steve Corey. Steve has been volunteering at Quarryhill for four years. Always available and on call when needed for countless different tasks at Quarryhill, from leading docent tours, to assisting with our many events as a greeter, parking attendant, and cart driver. Steve has been instrumental in providing professional photo documentation of the many plants in the collection. He has taken a leading role in our new phenology project to study the changes and impacts associated with climate change on plants. Steve says that his time at Quarryhill has opened up new horizons socially and emotionally for him.